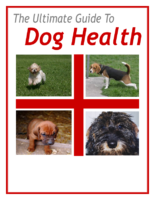 Share the post "The Ultimate Guide to Dog Health: Spot and Prevent Dog Health Problems"
Let’s face it. At some point your dog will get sick. What are you gonna do? The Ultimate Guide to Dog Health is a dog health book written by Malcolm Fields, a professional dog trainer. It’s a comprehensive guide that covers common health issues dog’s are most afflicted by. The purpose and focus is on being prepared for an ailment as well as taking preventative action. It teaches you, through colored charts, how to self diagnose conditions in your dog. It’s loaded with information and guidance from veterinarians and trained dog-care specialists. The bottom line is, this book is so comprehensive, it goes into detail of most of the common health conditions and illnesses. It’s a great introduction to dog healthcare that will teach you how to take goo care of your dog without wasting $1,000s of dollars on vet bills! It’s easy to read too. I expected it to read like some textbook, but it’s not. It’s written in every day language. I didn’t expect it to cover such serious symptoms, but it does. The book teaches you how to pick up the early warning signs of problems by learning how to interpret your dog’s body language. The Ultimate Guide to Dog Health teaches you how to properly groom your dog, no matter what hair length. It also teaches you how to care for your dog’s teeth and gums and how to tell your dog has a toothache. You’ll also learn how to provide medication to your dog safely and easily. You’re able to easily understand all of this seemingly complicated information because the book supplements you with full color blueprints, charts, photographs and illustrations. Whenever I review a product, I’m always thinking, “And how does that help the person reading this?” So, I asked myself, how can the Ultimate Guide to Dog Health help you? Well, by including all of the comprehensive, step by step charts and blueprints, The Ultimate Guide to Dog Health assists the dog owner to make serious decisions about their dog’s health-care. For instance, each chart starts from the specific symptoms of a specific condition and shows the dog owner the recommended path of remedy for each one. More importantly, it tells the dog owner whether a vet should be called and how soon. You get a lot of practical freebies. I’m not talking about the usual junk people throw in and call “bonuses.” These freebies have serious value. They’re ebooks that will make your dog’s life so much better! 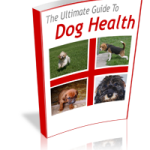 So what freebies do you get with The Ultimate Guide to Dog Health? 1) The Ultimate Guide to Dog First Aid, which is a remarkably valuable resource for those conditions demanding an instantaneous response. 4) 20 Super-Healthy Recipes for Your Dog, that shows that doggie health food is as yummy as anything else! These e-books have got a combined value of over $80, not a bad freebie! The Ultimate Guide to Dog Health is a comprehensive dog healthcare resource that all dog owners should have. It’ll help you make good judgment calls regarding serious and not so serious health issues all dogs suffer from time to time. You’ll learn preventative care so that you’re able to spot the little issues before they turn into big ones. I highly recommend The Ultimate Guide to Dog Health. « How To Stop Shiba Inu Aggression In The Dog Park!